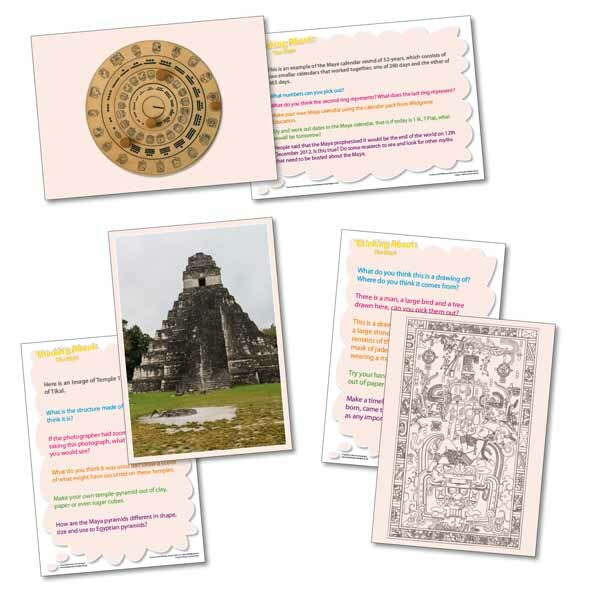 These 20 A5 Maya Fact Cards feature a photograph on one side and five questions or activity suggestions on the reverse. The variety of questions and activities means that work can be pitched at an appropriate level for most abilities. This product is suited for the Maya Key Stage 2 (KS2) curriculum. Created with WildGoose Education, these cards have been designed to develop an enquiring approach to the subject and encourage observational and descriptive skills. What are the differences and similarities between Maya numbers and the Roman numeral system? People said that the Maya prophesied it would be the end of the world on 12th December 2012. Is this true? Do some research to see and look for other myths that need to be busted about the Maya. What nutrients do we get from maize (corn) and what other foods were ancient Maya staples? How are Maya pyramids different in shape, size and use to Egyptian pyramids? The Maya practised a variety of farming methods, find out what these were and write a report on it. Make your own stela using clay, card or paper. Draw yourself on the front as a Maya king or queen and add in important events from your life on it. Make a timeline of when King Pakal was born, came to the throne and died, as well as any important events in his life. Only four codices (Maya books) survive today. Find out where they are located, why we only have four and what they are concerned with.